This was a good work week. I weeded Curly Dock in Buffalo Ridge Prairie, and Mike mowed Western Prairie/Field for the second time. It wasn’t too hot to work except right in the middle of the day. 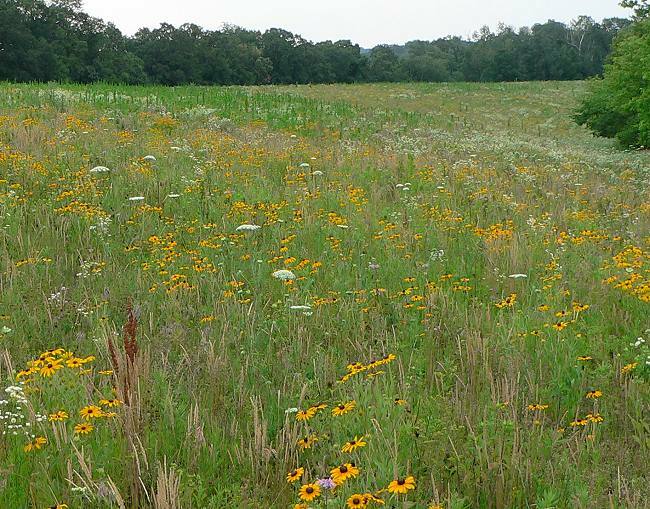 This is the second year for Buffalo Ridge Prairie, so we’re letting it grow without any mowing. It’s looking pretty good – there are lots of prairie plants coming up and blooming, but there are still quite a few weeds. Here’s another view looking north. 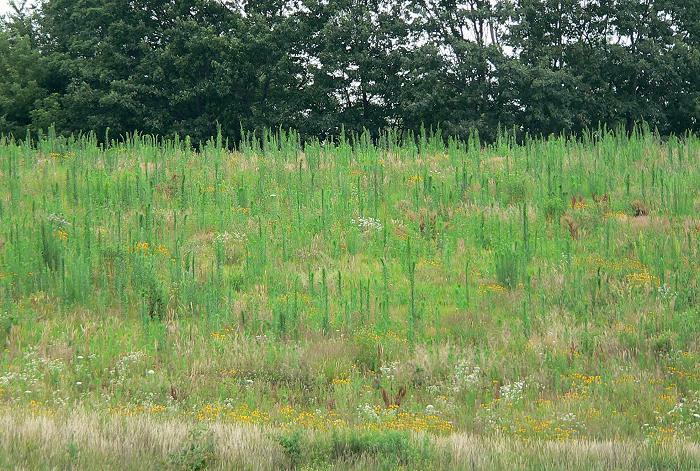 The three most common weeds are Canadian Horseweed (Conyza canadensis), and Lamb’s Quarters (Chenopodium sp. ), which are both native, and Curly Dock (Rumex crispus), which isn’t. We thought about mowing but we’ve decided to give the prairie plants a chance to choke out the weeds. I’m more worried about the Curly Dock, and I know that cutting it helps, so I’ve been cutting and removing the flowering stalks. 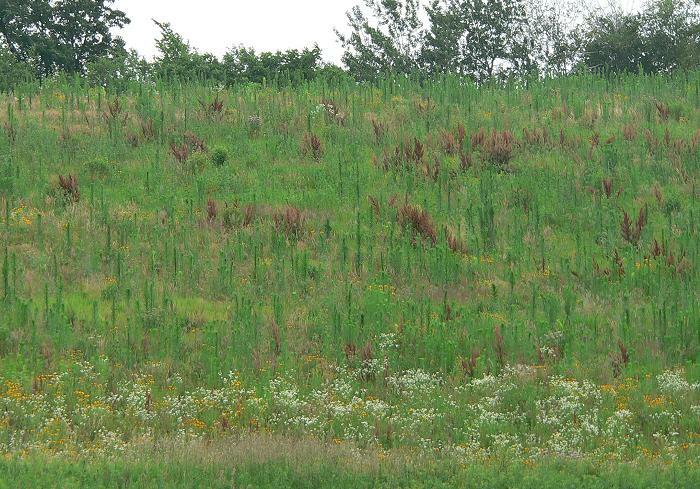 Here’s part of the west-facing slope with lots of Curly Dock. And here’s a similar area after I weeded out most of the Dock. 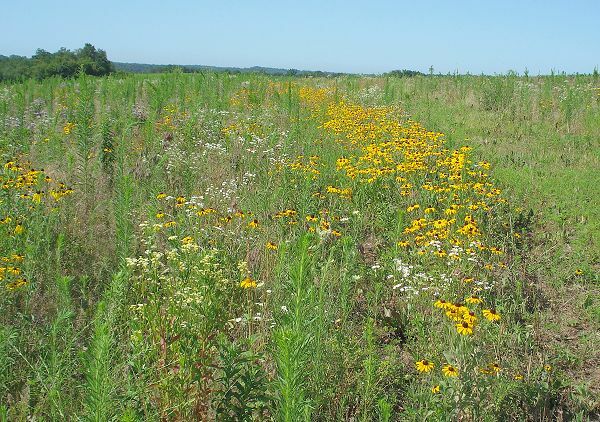 I’ve always had trouble with the edges of the prairies – that’s where most of the weeds are, and it’s difficult to keep them from invading the nicer parts of the prairie. 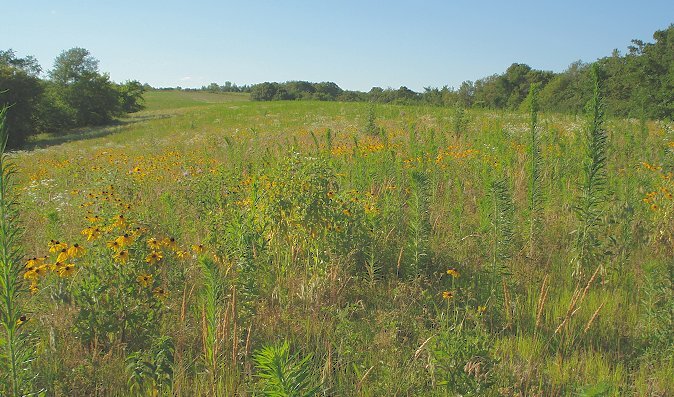 So in Buffalo Ridge Prairie I tried an experiment. 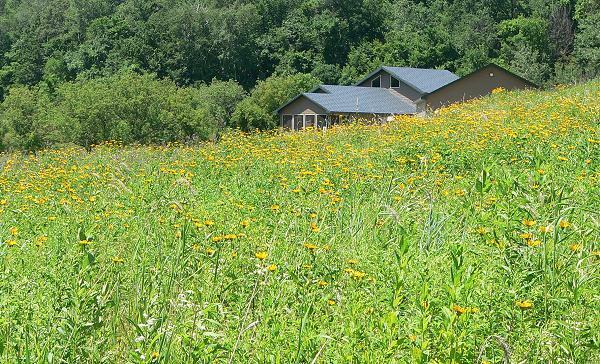 I made a seed mix of aggressive prairie plants: Yellow Coneflower, Monarda, Evening Primrose, Black-eyed Susan, Indiangrass, Wild Rye, and Big Bluestem, and planted it all around the edge. I can really see that edge now – it looks beautiful and I think it’s going to help. You can see the edge – with all the Black-eyed Susans blooming – at the right side of the picture. Western Prairie looks beautiful even just as a mowed field. Here it is from the tractor as Mike was mowing. Some of my favorite flowers are blooming now. 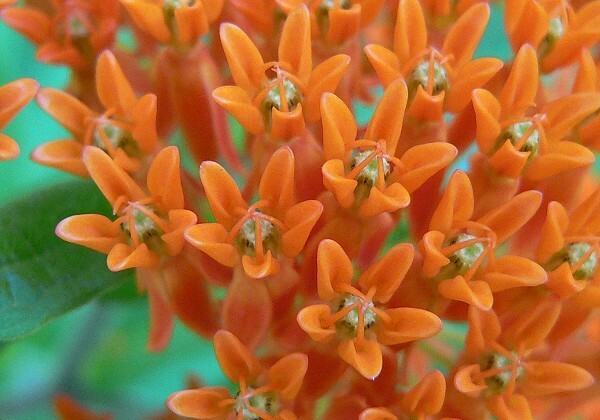 One of the most colorful is Butterfly Weed. 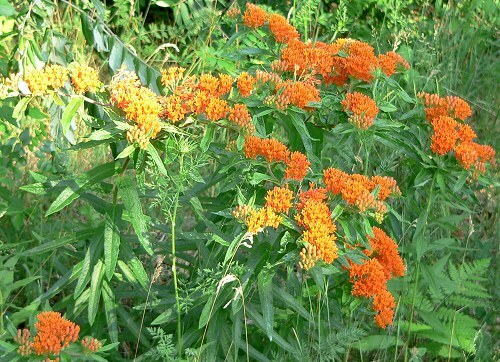 I keep planting it in our prairies, but it hasn’t come up in many places yet. But we have several remnants with a few plants in them. This is the biggest clump we have – along the Knife Edge. Here’s a closeup of the flowers. I found Golden Aster blooming in the prairie next to the house – I’ve planted lots of the seeds there, so I hope there will be more coming. 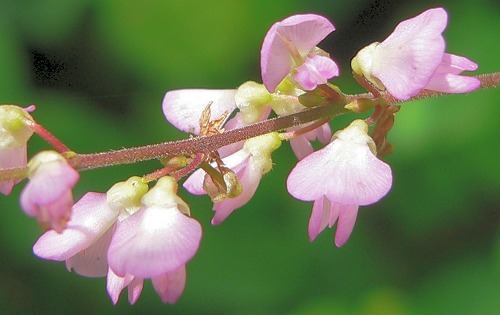 Here’s Clustered Tick-trefoil. 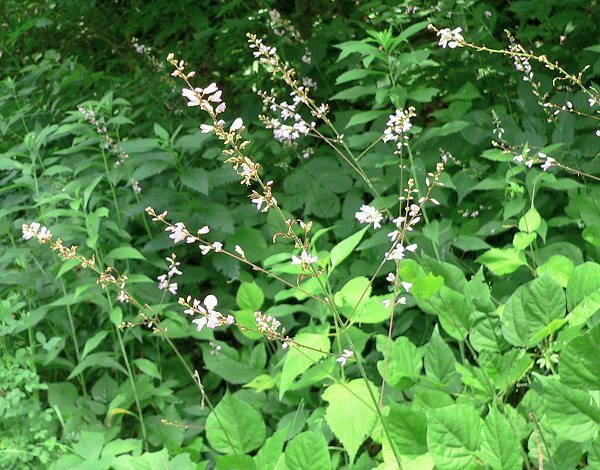 It’s a very common native that grows along woodland paths. 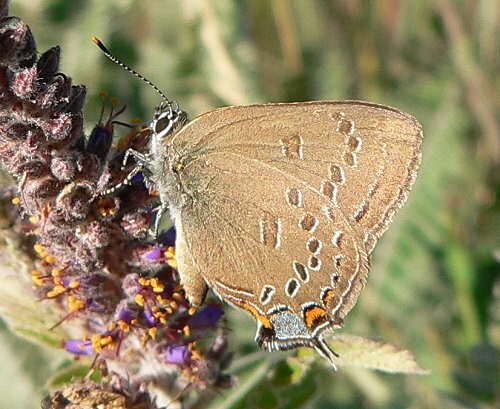 It has small flat seeds that have a Velcro-like surface and stick to clothing in the late summer and fall. 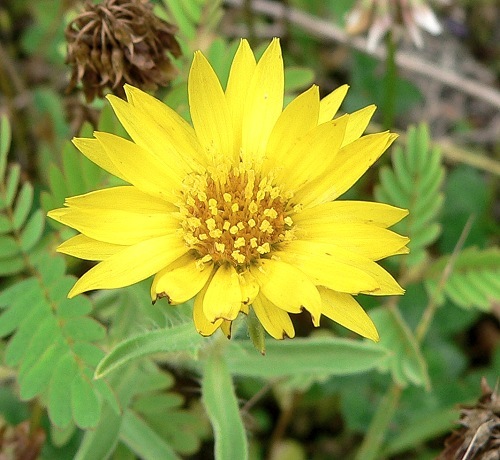 3 Finger Valley is full of yellow blossoms right now – mostly Oxeye and Giant St. John’s Wort. This is the Oxeye near the house. I’ve been experimenting with taking photos through my hand lens. It’s a very small lens with 10x magnification. I love looking into its tiny world. 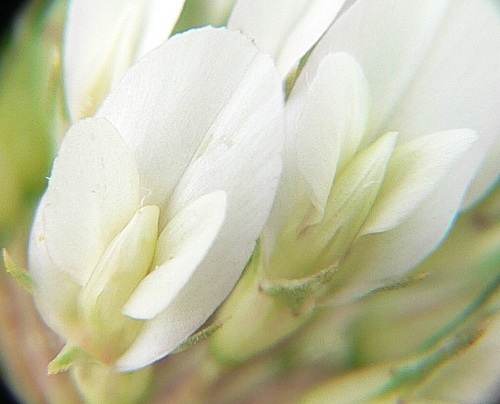 Here’s part of a White Clover flower through the lens. 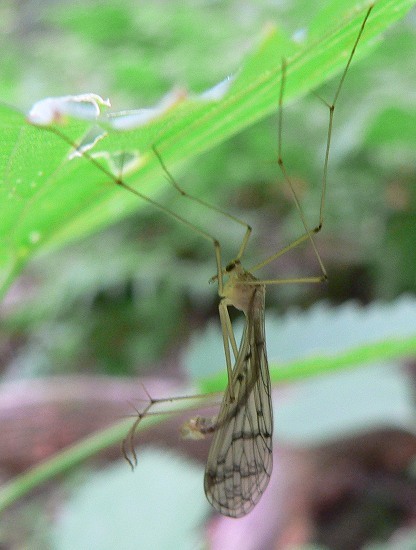 When I walked up through the woods there were dozens of leggy insects that flew up from every leaf. They look like Scorpionflies with their long heads and long patterned wings, but they have very long legs and they were hanging upside down under all the big leaves. I checked with Margot and they are Hangingflies, or Hanging Scorpionflies, in the order Mecoptera, Bittacus sp. The Eastern Phoebe babies that have been growing up next to our front door are spilling out of the nest. I’m sure they’ll be fledging any day now. They stare at us curiously every time we walk in or out of the door. As I was driving the gator down the road by the cabin I startled a Woodcock. It sat frozen in the middle of the road while I took pictures – but it flew as soon as I got out of the gator. 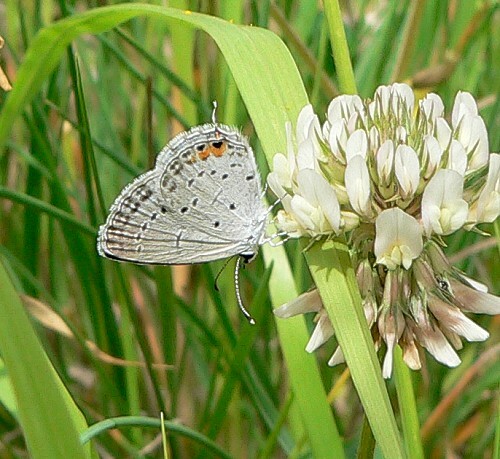 We tried to do the annual Buffalo County Butterfly count on Tuesday, but it rained almost all day – the first rainy day we’ve had in at least a month. 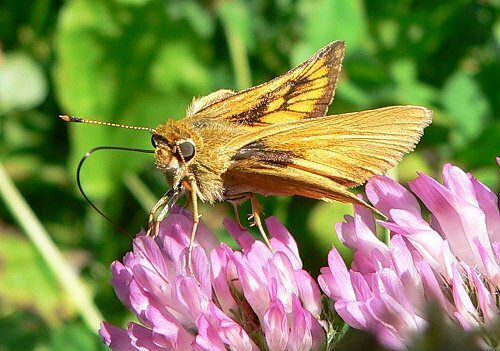 All the butterfliers gathered at our house, and we ate doughnuts and talked for most of the morning. We finally did take a walk, but it rained the whole time and we didn’t see many butterflies. 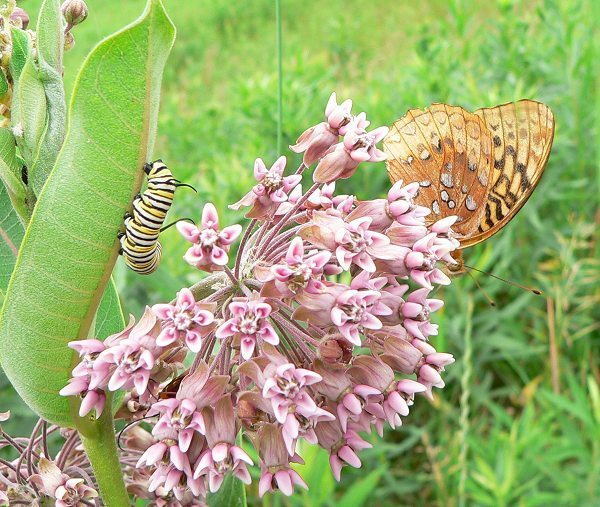 Mike Reese counted all the ones we did see – the most numerous were Common Wood Nymphs, and then Monarchs. 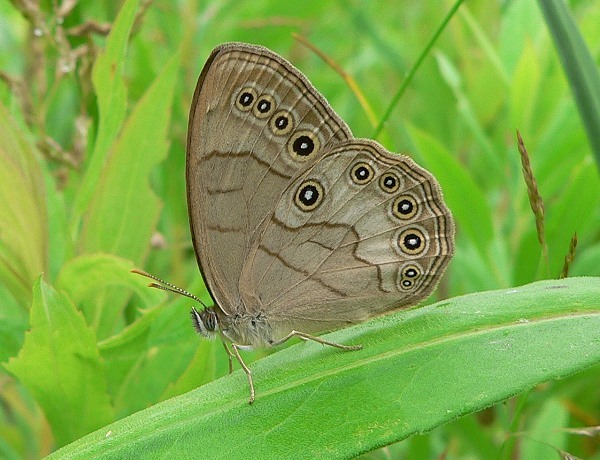 We found one new butterfly for our land – an Appalachian Brown. 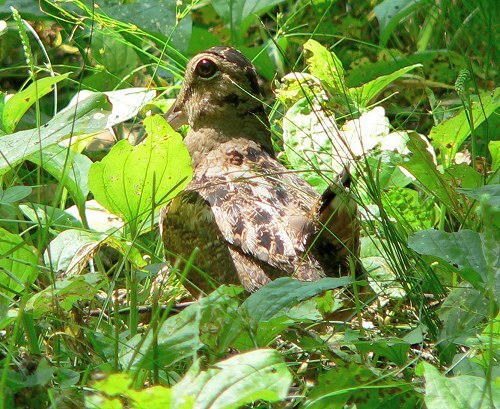 It was sitting on a leaf in the wetland, and was very cooperative – we all got photos. Right after everyone left the sun came out and so did the butterflies. 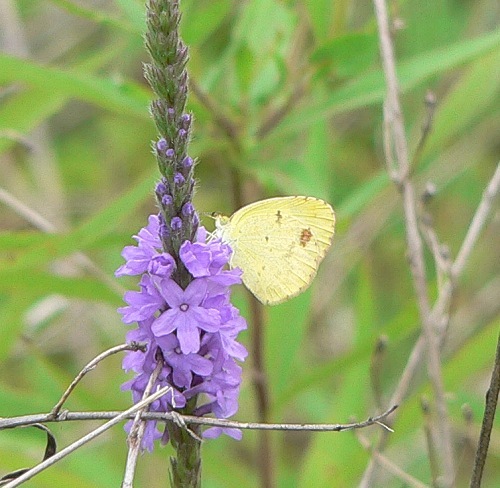 I saw two Little Yellows dancing in the prairie next to the house – they were nectaring on the purple Hoary Vervain.